Vou a cantar-te nos meus versos. Ah yes. ‘Brazil’. Terry Gilliam’s wonderful but flawed vision of a bureaucratic nightmare future, with its recurring stay-in-the-brain tune, ‘Aquarela do Brasil’. 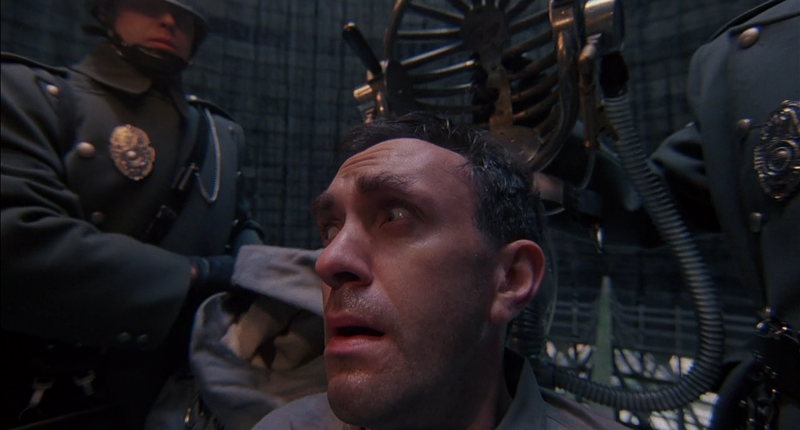 Set in a dark, near distant retro-future where the main character, played by a brilliantly hapless Jonathan Pryce, is beset by troubles as he accidentally incurs the wrath of the straightjacket of conformity in a tyrannical police state, with its Latin American overtones and echoes of our present. And all for the love of a fair damsel who may or may not be a terrorist / freedom fighter. It is a true tragic-comedy with wonderful performances from all, including a great eccentric turn from Robert De Niro as a mysterious gremlin-subversive within the bureaucratic machine and a chillingly straight vision of a decent torturer from Michael Palin. Impressive visuals, fantastic sets, nice special effects, and a serious message behind the Pythonesque antics, make this one of Gilliam’s best movies. Though receiving a mixed reaction at the US box office, most critics liked it, and European audiences gave it a much more favorable viewing. It has achieved a beyond-cult status ever since, being regularly named in lists of Top 20 Sci-Fi movies, and remains one of the most visually and stylistically influential Sci-Fi movies of the 1980s, frequently being hailed as one of the cinematic sources for the steampunk movement. Unfortunately the only readily available edition in Europe is a fairly basic DVD version, lacking in real extras, but the movie is well worth purchasing if you haven’t seen it before.